Hello there! Just a really quick post today sharing a little something I created Super Bowl Sunday for a variety of challenges, including Scrap Our Stash for the Book inspired stash challenge. I really struggled with this cover. In the end, I went simple. I liked burst coming from behind the 'animal'. So here I used a bold striped paper coming out from behind the photos. The theme of the page is family love so the hearts were a great embellishment choice. I've had these photos for several years. They are the last I have with my Grandfather. I think that's why it's taken so long for me to scrap them. Although it was getting harder for Momo to get around, he could never say no to any of us. We enjoyed a beautiful winter day with a walk on the pier together. Thanks for stopping by my creative view today. I've got some exciting things coming up so check back here again this week. I love this page!! Great take on the challenge. I love all your embellishments!! Thanks for joining us at Scrap Our Stash! What a fantastic challenge take. Love the details and great stash use. Your page came out awesome. Thanks for your entry in our challenge at Scrap Our Stash! Aw Devra there is so much heart in this page. What a beautiful tribute! So glad that you linked up at SOS! Love the page!! Great use of embellishments and interpretation of the sketch!! Thanks for joining us at SOS!!! Another great page, Devra! 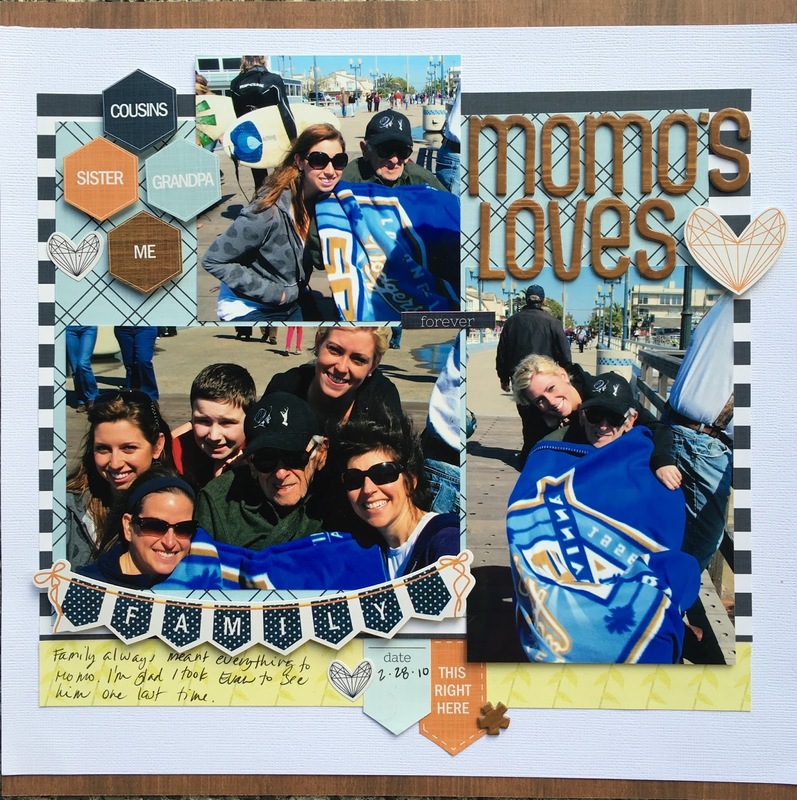 Love the hexagons and that you used 3 large photos on this single page lo. Nice work! Thanks for joining us at SOS!! Awesome layout Devra. I love every detail on this page. Thank you for joining us at Scrap Our Stash. Great page, lovely embellishments. Thank you for joining us at Scrap our Stash.